During this advertisement break, Hokey-Pokey may be bought from the gentleman with the handcart at the front. 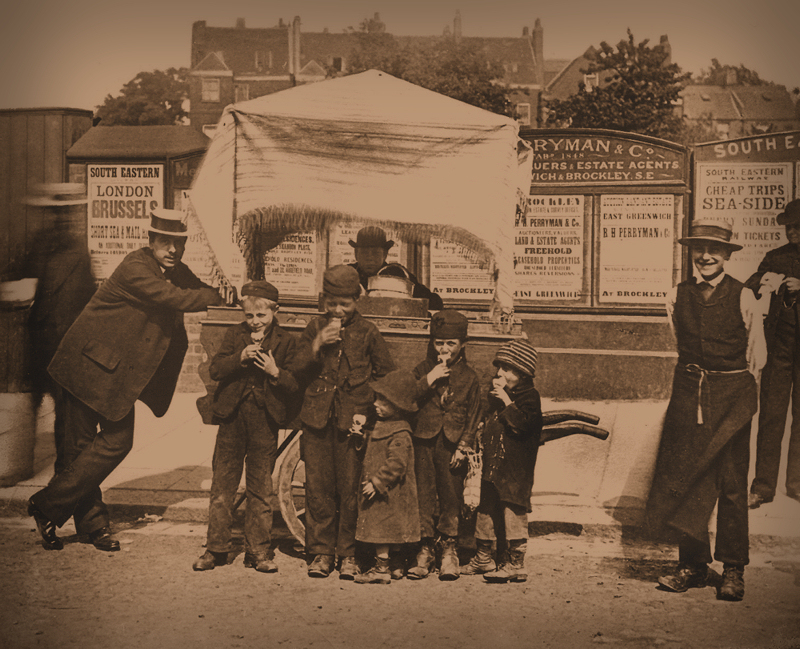 Victorian ice cream – a.k.a. Hokey-Pokey. Contamination often proved to be a serious health risk. Photograph ©Public Domain. Consume at your own risk; the management refuses to accept the presence of fleas, torulæ, bacilli, lice, bed bugs, cotton fibres, bugs legs, straw, cocci, human hair or cat and dog hair in the ha’penny ices. Nor will the management be responsible if you contract scarlet fever, diphtheria, typhoid or diarrhoea from partaking of these treats. Activity Media‘s ‘Right Track’ DVDs have been helping modellers improve their techniques for almost 10 years. The latest in the series – number 19, believe it or not – takes us right back to the beginning with layout planning and design. Unless your surname name is Freezer or Rice (oh, OK then, or Dunkley!) then chances are that at some point in the planning of your latest masterpiece you’ve sat with a blank sheet of paper in front of you and a waste basket full of scrunched up paper trailing behind. Fortunately Paul Lunn’s name can be added to that list of luminaries of layout design, and coupled with Paul Marshall-Potter’s skilled eye for translating a design from paper to stunning model, this team presents a powerful addition to the Right Track series. Many of us railway modellers are wedded to a scale and gauge, and this is the first sacred cow to be unceremoniously kicked over, and a compelling argument is put forward for choosing scale based on wants and needs from a new layout. Coupling choices are the next element to stand in the dock, and not just on the usual ‘play value versus scale appearance’ card we’re all so used to hearing, but instead based on how train length is affected by one type or the other, and how that impacts on our design. Thought provoking stuff. With our comfortable world now turned upside down, we’re suddenly find ourselves within the habitat of the modeller; all so often our esoteric little hobby drags us away from family down into the shed at the bottom of the garden on a wet and windy night or up into the sauna-like humidity of a loft space in high summer. Not the always the best for harmonious household relations, and it needn’t be so. Based on a stylised representation of footfall though the house, we’re shown where hitherto unconventional sites for a ‘shelfie’ may in fact prove to be ideal and leave us feeling a little less like Johnny-no-mates. On to the nitty-gritty; what do we want from a layout? Actually, what do we need might be the better question, and after writing out a checklist we’re building a quick mock-up from card and foam to see if all these elements of desire and necessity actually work together. Our perception of perspective, layout width and the backscene are briefly challenged – a foreshadow of things to come later in the programme. Another chestnut roasted on the fire is the argument of prototype verses freelance trackplan, and Paul Lunn takes us though developing a layout based on a prototypical plan which ticks most of the boxes on our checklist. This is smartly followed up by the design of a freelance layout based on prototypical practice, but developed specifically to incorporate the choices we’ve made and rounds off the first hour of the DVD. Moving from a two dimensional plan to a three dimensional layout can be a daunting task, and Paul Marshall-Potter describes how a very workable trackplan he had for a transition-period urban East End layout just simply didn’t ring true once he began the 3D process. A 1980s aggregate works, in which the often haphazard placement of view-blocks are challenged, where features are moved to de-compact the view, promote sight-lines, and to make their inclusion and placement more logical. In addition, lighting and how to eliminate shadows from the backscene are considered. Wharfdale Road where we revisit some of the earlier choices such as space, couplings, length of sidings and loops and the use of smaller prototypes to suit the layout footprint. Paul Lunn takes the original premise, converts it into a layout design, and then Paul Marshall-Potter adapts it to build the DVD’s project layout. Again we revisit earlier themes and are shown practical examples of how to force perspective at the ends, the advantages of a natural eye-level viewpoint, how to control sight-lines at the entrance/exit of the scenic section and the effect of curved corners on the backscene. Rounding this section off we also consider how a viewer’s eye is naturally drawn to the centre of the layout, and how the often-used half-relief gable ends of buildings – which look great head on, but rather silly from the side – can be diffused with tree lines to create a more convincing background. With the second hour up we move to the inner sanctum where the crown jewels are kept; Paul Marshall-Potter’s two layouts, Bawdsey and Albion Yard. The former was originally built by Chris Matthewman in the early 1990s, and was based on 1930s practice in East Anglia. Paul discusses the changes he has made to bring the timeframe forward to the transitional period of the early 1960s, the weaknesses of the typical early 1990s construction elements such as open fiddle yards, segmented low backscenes with right-angled corners and how he’s overcome them. Designing layout construction for transport is also touched on. Albion yard, on the other hand, was designed and built solely by Paul and incorporates modern and some very forward-thinking elements, such as the long and high single piece printed backscene which extends beyond the scenic area into the enclosed fiddleyard for visual purposes. All in all it’s a valuable addition to the Right Track range, and particularly if you’re at the beginning of a new project, or part way through one and you’re feeling jaded as it’s not working out as you’d hoped. On being sent my gratis reviewer’s copy, I was told to tell it as it is; good or bad – don’t pull your punches. Despite not receiving my promised reviewer’s fee of a bacon sandwich (you owe me in sauce Mistah PMP), I thoroughly recommend this DVD to newcomers of the hobby and grizzled old hands alike. This cheeky ping from Simon Dunkley’s blog The Erratic and Wandering Journey is the perfect opportunity to exhort readers of this loquacious journal to visit Simon’s own effusive writings.